You no doubt know the name Coral from the many betting shops and casinos they operate throughout the United Kingdom. 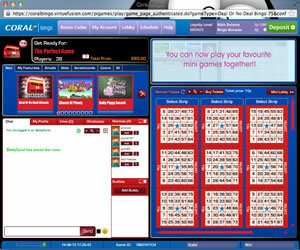 In October 2012 though, they added online bingo to the wide range of games they already had available online. They opted to power the site with the Virtue Fusion software and made it part of the Virtue Fusion network, which gains them access to both tried and tested games and a well established fan base to build upon. 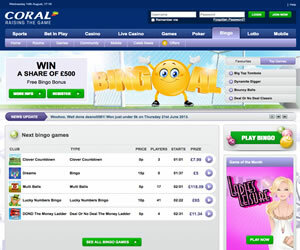 Coral Bingo is integrated into the main Coral site, so it sits alongside Sports, Bet in Play, Casino, Live Casino, Games, Poker, Lotto and Mobile. Registering takes just a few minutes, and once you are up and running you can access any of these sub-sites (or wallets) with the same log in details, so there is no chance of you ever being bored or stuck for something to do. You will be welcomed with £5 worth of free money as soon as you have made your first deposit and wagered £5. 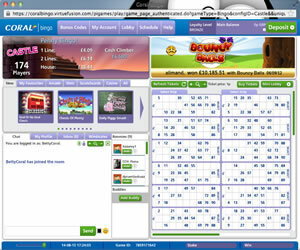 The Coral Bingo homepage sticks to the brands blue and white colour scheme. We would not call it the best looking site out there but it's well designed and functional, with everything you could possibly need just one mouse click away. The top of the page is dominated by a scrolling banner packed full of information on their latest special offers and new games, whilst the rest of the page brings you details of bingo games starting in the next few minutes, allowing you to access them in a hurry. Head into the lobby, and the first thing you will notice is the addition of the 'Room Finder'. This handy little gadget allows you to choose where you want to play, the price you want to pay, the prize you want to win and even the number of players you would like to compete against: Just use the slide bars to set you preferences, click the 'Find a Room' button and it will show you the rooms that most closely match your criteria. There are plenty of rooms to choose from, offering 75 ball bingo, 80 ball bingo, 90 ball bingo, themed games and a wide range of instant games. Unlike the majority of networked sites out there, Coral Bingo also offers exclusive rooms too, so you will only be playing against people that have signed in via the Coral portal. No matter which room you choose, you will find them all well laid out with large portions of the screen dedicated to both chat and displaying your cards. There are none of the novelty features that a lot of sites offer, but to be honest you won't really miss them. The main emphasis of Coral Bingo's promotions is guaranteed jackpots, and you will often find them giving away up to a quarter of a million pound through their .Winning weekends'. In addition to this there are three Bingo Linx games each day at 12pm, 6pm and 10pm with prize pots ranging between £1,500 and £4,000. On the last Sunday of each month, they host a Super Bingo Linx game and give away a whopping £10,000. If you are playing on a restricted budget, there is also free bingo and penny bingo for you to take advantage of. 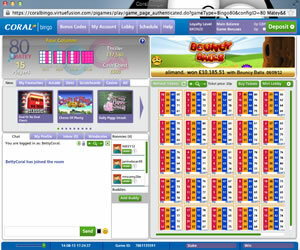 Coral Bingo is a great online bingo site and in our opinion, one of the best Virtue Fusion powered sites on the market. There are plenty of games to choose from, loads of big jackpots to be won and enough promotions to keep things interesting. Add to this the ability to access all of the other wallets too and you have yourself a site that not only caters for all of your needs, but also a site that portrays the quality we have come to expect from the Coral name. 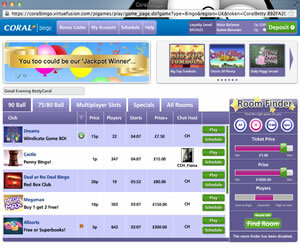 Coral Bingo offers 75 ball, 80 ball and 90 ball bingo as well themed games, slots and instant games. The wagering requirements are 2x the bonus money received.